Amanda Ford joined the United States Marine Corps on May 25, 2004. During Basic Training (boot camp), she received the prestigious Molly Marine Award. This award is presented at the recommendation of her peers and is given to only one recruit per graduating platoon that demonstrates qualities of an exemplary Marine. After basic training, she was assigned to Camp Pendleton, California as an Aviation Operation Specialist to the Marine Medium Squadron 364 (hmm-364) that consisted of the CH-46E Sea Knights. Amanda was an extreme asset to the unit and deployed to combat after only one month. Quickly picking up rank to Corporal (e-4), by her second deployment to combat Corporal Ford was now the Chief of Aviation Operations. Alongside many commanding officers, she noticed more aircrew was essential for their mission. Corporal Ford happily volunteered to be an Aerial Observer/Door Gunner for the CH-46E. By the end of her second deployment of seven months, she came home with over 300 flight hours. This included night vision time and earning five Gold Combat Air Medals. At the time, Corporal Ford was approximately one in twenty female Marines enlisted as Aircrew Man in the United States. Amanda officially started competing in the Highland Games during 2015 after completing her service in 2008. In her first year throwing, she quickly placed herself at the top of the list of the North American Scottish Games Athletics Roster (nasgaweb.com). At the end of her 2015 season she ranked 23rd out of 571 competitors. She started her second season off strong, turning heads and making interest for other games by more requests for female athletes. Amanda was chosen for the East Coast/West Coast Women’s Heavy Athletics Challenge Highland Game. Later that year, she was also chosen for the US World Championship Highland Games in Pleasanton, California. In 2016, Amanda was gaining new personal records, pushing her goals, and an increasing amount of personal invitations. One of her greatest accomplishments in 2016 was taking a huge win at the 61st Annual Grandfather Mountain Highland Games. This was the very first time women were allowed to compete at that competition. Thanks to generating more interest and entertainment, Amanda Ford landed herself on the cover of Endurance Magazine. She ended her second season ranked 24th out of 619. 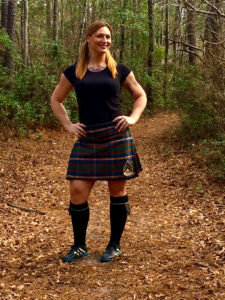 In 2017, she was chosen as one out of seven athletes to compete in the very first Indoor Highland Games at the USA Arnold’s Sport Festival, the largest multi-sport festival in the world. She took home 4th place. Amanda also made her second debut at the US World Championship Highland Games. At the end of 2017, she was ranked 21st in the nation out of 638. The 2018 season has seen Amanda starting strong. You can see a video of her at the Arnold’s Sport Festival Indoor Highland Games on the Uncle Sam’s Highlanders Facebook page.